This lone Saguaro looks across the land of the petroglyphs of the Painted Rocks Petroglyph Site east of Gila Bend, Arizona USA. 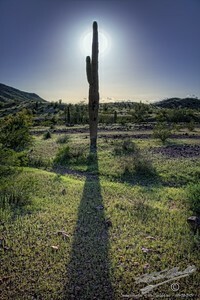 Because Sentinel has one branch and is as tall as it is, the age of this cactus is estimated to be between 40, and 70 years old. This cactus could be my age, having seen what I have seen, and knowing what I know of life. But, this cactus is far smarter than I will ever be. He stands in the sun, year after year, watching the world, smelling the seasons as they move through time. This lone sentinel watches the stars at night, as they mark astronomical time. This sentinel marks the shadow of the sun across the desert floor, while I run around scraping together things needed for my life to continue. He feels the water course down his flesh, pool at his base, and swells when it is ingested, expanding his structure so that he can pass the dry times. … I cannot go more than a few hours without water. But, Sentinel cannot drive my Toyota. This entry was posted in Flora, Landscape, Nature, Purchasable - As Art Prints, Sunset. Bookmark the permalink.